Hello blog friends. 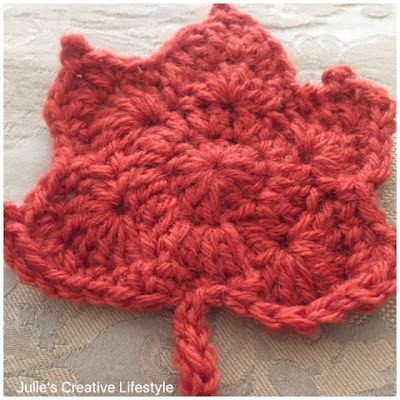 I have taken a break from crocheting and knitting this summer, but now that fall is here, I have been so inspired to crochet and create some fall leaves. 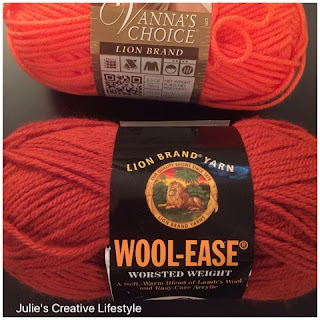 Below you can see the Lion Brand Yarn that I chose to crochet the leaves, but you can use any kind of yarn and colors of your choice. 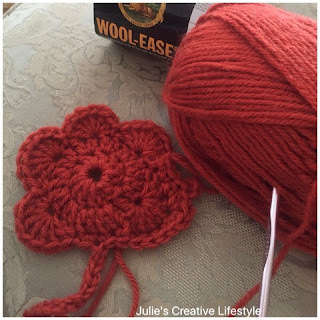 I enjoyed sitting on the couch, watching TV, while crocheting the leaves. I will be making a few more of these to display on my mantel, to go along with my fall decorations. The pattern to make the leaves can be found HERE. I hope I've inspired you to crochet these fall leaves for your decorations too! To see more crochet projects, you can click HERE. Wishing you all a wonderful end of the week and weekend. Jess and I will see you all back here Monday for our Cooking and Crafting with J & J Link Up! It feels like fall today! 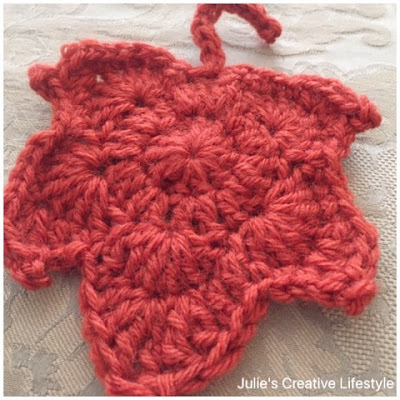 What a cute crocheted leaf! Pretty! Wish I could crochet! Well, how cute is that fall leaf! We made some fabric pumpkins today! I will go check out your pattern! I do hope your doing well! Next week is the first day of fall... Now where did summer go? What a fun fall decoration! I have a long dark wood table in the dining room, it would be fun to have a bunch of them scattered down the middle!! I hope you have a great weekend! Julie these are really cute. You are so talented with the crochet hook. Have a wonderful week end. Your stitches are so even julie! I never could do that!! oh Julie, the leaves are stunning. You do such great work. I am so ready for Fall. Very sweet! I will have to forward the pattern to my friend Bonnie who knits and crochets constantly. Very pretty, Julie! Thanks for sharing at Vintage Charm! Pinned! So cute. That is one needle art I haven’t mastered. I wish I could. Thanks for linking to Keep in Touch.